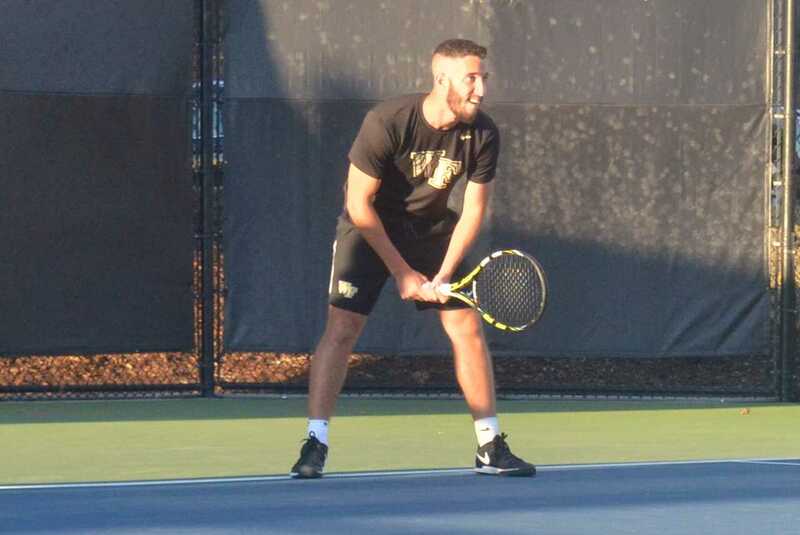 The Wake Forest tennis team has another thrilling win under their belt as they beat No. 3 Virginia at home this past Friday. The match was delayed two and a half hours but when the play began, it was worth the wait. Doubles play was nothing short of spectacular, since the lead continued to change on every court. Though the Deacs never had momentum and found themselves in an early hole, they responded to take the overall point. Sophomores Petros Chrysochos and Dennis Uspensky beat their opponents in a 6-3 decision. Though the score says otherwise, the match was closely fought. Junior Skander Mansouri and redshirt junior Christian Seraphim battled the No. 49 duo of Luca Corinteli and Henrik Wiersholm to a tiebreaker, eventually claiming a 7-4 victory in the tiebreak to clinch the doubles point. Since Wake Forest had won two out of the three matches, action on court two was suspended. However, freshman Borna Gojo and redshirt freshman Alan Gadjiev were up 6-5 with Gadjiev’s three-digit serve ready to be unleashed. There was no way they would have lost that set. Chrysochos showed critics why his name should sit at the top of the singles ranking. Other than being named ACC player of the week, Chrysochos came back from a disappointing second set to lead his team to a historic win. The team victory was the first over Virginia since 1995. The No. 2 ranked player in the country beat No. 6 ranked Thai-Son Kwiatkowski, 6-1, 2-6 and 6-3. Mansouri, ranked No. 14 in the nation, comfortably beat No. 64 ranked Collin Altamirano. His 6-4, 6-4, victory consolidated the Wake Forest lead, since he was one of the first to finish. On a side note, he received the call to represent his native country of Tunisia for the first time in the Davis Cup. Gojo has contributed from the moment he first step ped foot in Winston-Salem only three months ago. He needed zero time to adjust to collegiate tennis and is currently ranked No. 57 in the nation. He is playing at No. 2 singles and after his win over his opponent 5-7, 6-3, 6-1, he might challenge Chrysochos for the No 1 slot. Uspensky continued his solid stretch of preformances with a good win over a ranked opponent. He won 4-6, 6-2, 7-6 (7-5) in a close match that should his capacity to dig down deep when needed. Though both Seraphim and Gadjiev lost their matches, they put in a good showing ensuring that Virginia had to tough out every point. Wake Forest returns to action for its final two home matches of the regular season on April 14 and 16 with ACC matches against Florida State and Louisville.